Figure 1 – Location of Dorado oil discovery superimposed on Lower Keraudren Formation isopach (Minken et al, 2018). 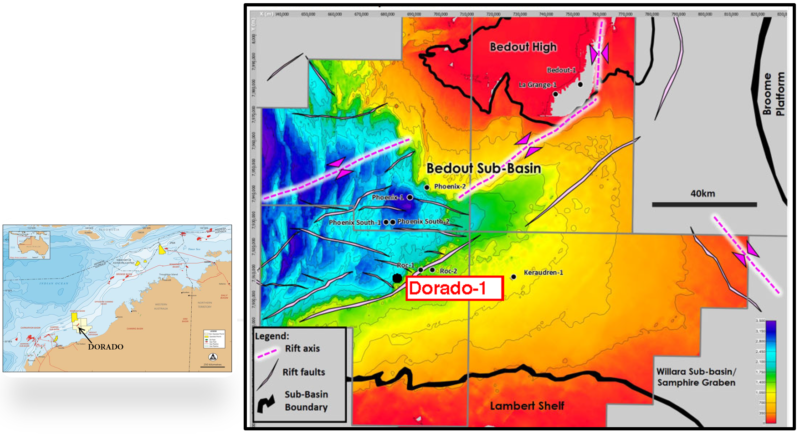 The Dorado-1 well is the first significant oil discovery in the Bedout Sub-Basin offshore Western Australia (Figs.1 & 2). The Bedout Sub-basin consists of a W-E to SE-NE trending depocentre filled with approximately 2.5 km of Paleozoic and 7 km of Mesozoic sediments. It is separated from the Beagle Sub-basin of the Northern Carnarvon Basin to the west by the North Turtle Hinge Zone and is partly bounded to the northwest by the Bedout High. Figure 2 – Schematic cross section of Dorado oil discovery (Carnarvon Petroleum, 2018). The main exploration target was the sandstones of the Caley Member of the Triassic Lower Keraudren Fm, which have been interpreted as part of a large fluvio-deltaic complex along the southern margin of the sub-basin. 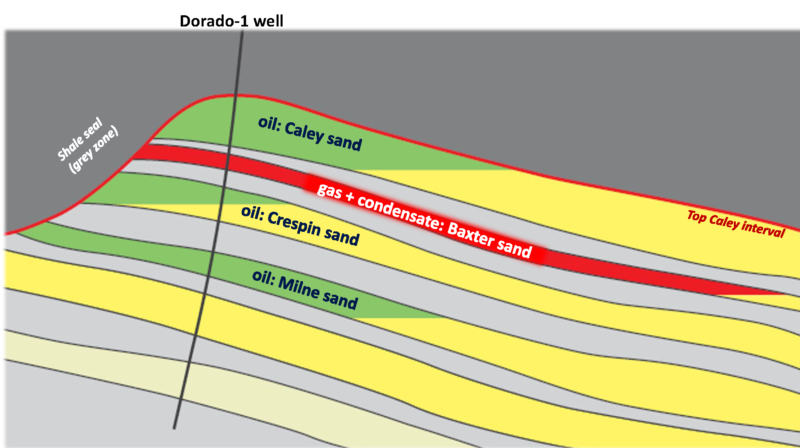 The Dorado-1 well encountered 96 m gross (80 m net) oil pay in these highly porous and permeable sands. Additional hydrocarbons were encountered in the underlying Crespin Member, Milne Member and the Baxter Member. Pressure data confirmed that there are multiple oil columns in the Caley, Crespin and Milne members and no water was encountered in the Caley, Baxter and Milne sands. The DAKS proprietary workflow of Capture > Search > Analyze > Insight has been employed to determine whether there could be an enhancement to the recoverable oil. The following information had been released on the primary reservoir (Caley Member of the Triassic Keraudren Formation) (Fig. 3). 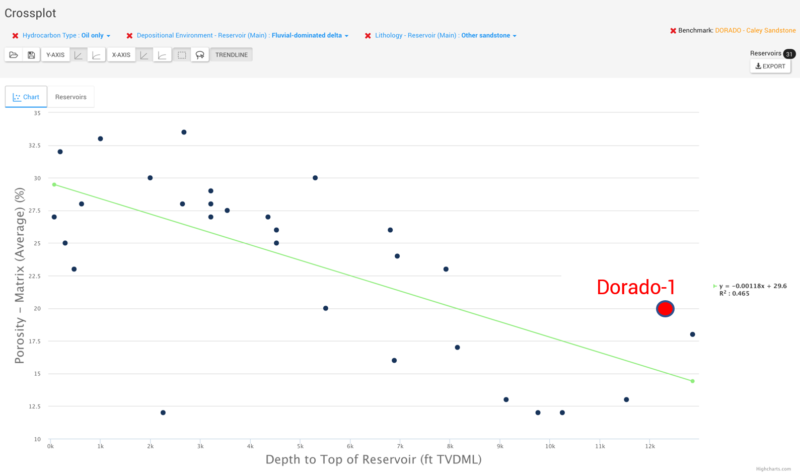 Figure 3 - Table of released Dorado-1 (Caley Member Reservoir) parameters. Using C&C Reservoirs pioneering classification system, Dorado is classified based on numeric and text parameters. All text parameters have a detailed hierarchy system to ensure global analogs can be found that are a true “apples to apples” comparison. For example, the Dorado Caley Member reservoir is regarded as a fluvial dominated delta, which is one of 43 possible depositional environments, all of which are logically organised and described in DAKS (Fig. 4). All global fields with similar lithology, fluid and engineering parameters were identified for the benchmarking exercise. The search techniques used will vary depending on the problem that is being addressed. If for example the number and nature of fluid flow barriers were being evaluated to build a detailed geological model ahead of reservoir simulation the fluid parameters would not help. 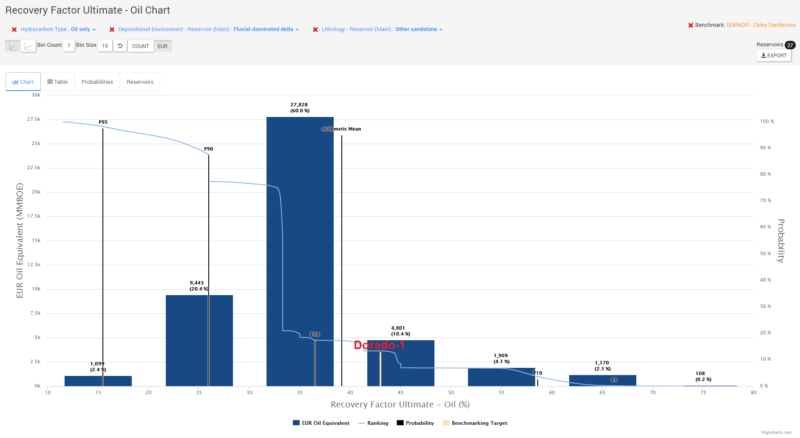 In this example, we are looking to benchmark the ultimate recovery factor, which will be controlled by the fluid characteristics, which also need to be used in the search technique. The image below shows the global distribution of fields that have comparable lithology and fluid characteristics so that we can contrast and validate the proposed engineering choices and ultimate recovery factor. Figure 4 – C&C Reservoirs classification scheme used for Dorado (Caley Member) depositional environment. The Dorado discovery is in relatively shallow water depths and an initial RF of 43% has been suggested, although the depth to the reservoir is significant. Can this reservoir depth curtail the possibility of a higher RF? The RF histogram from the applicable global reservoir analogs (Fig. 5) indicates a P50 RF of 38%, with an upper range (P10) in excess of 55%. More details on the RF by the development scenarios employed and the incremental recovery achieved through the application of improved recovery or enhanced oil recovery techniques can be learned from these analogs. The Caley reservoir has an anomalously high porosity (20%) given the reservoir depth when benchmarked against other global analogs (Figs. 6 & 7). This porosity value is the result of a much cooler than average geothermal gradient (2.00 - 2.50 C per 100 m) within the Bedout sub-basin when compared with other NW Shelf basins (3.240 - 5.560 C per 100 m). The Miocene sandstone play type seen in the Dorado oil discovery has numerous global analogs which indicate that the RF could exceed the 43% originally estimated. For those offshore fields that have exceeded 43%, their reservoir management best practices include pressure support through continuous water injection and extended reach horizontal wells. Thus, whilst being the deepest reservoir in this region of Western Australia, Dorado has a very thick net pay combined with very light oil and a relatively high porosity. 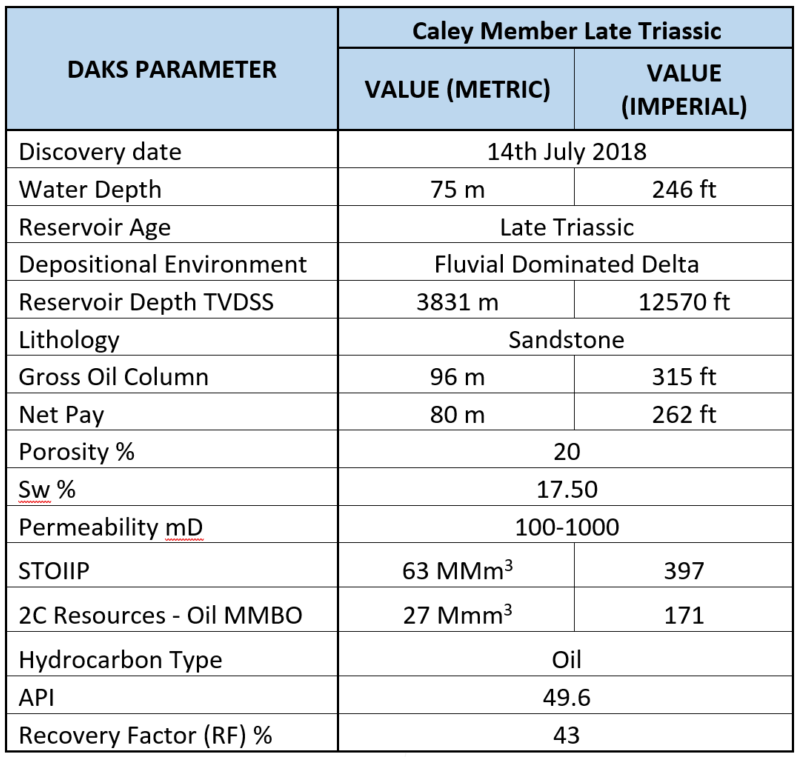 Taking all these factors into account together with the fact that no water was encountered in the Caley Sands, the 2C resource figure of 171 MMBO, quoted by the operator, may yet have further upside. If so, this would make Dorado the largest oil discovery on the NW Shelf of Australia. The previous most recent discoveries were Ravensworth (65 MMBO EUR) and Stybarrow (60 MMBO EUR) in 2003. Should you wish to learn more about the Stybarrow Field, there is a C&C Reservoirs Field Evaluation Report available through this hyperlink. Carnarvon Petroleum, 2018, RIU GoodOil Presentation, Sept, 24 p.
Figure 5 – Recovery Factor Histogram (DAKS Search criteria: oil, fluvial dominated deltas, other sands). Figure 6 – Porosity vs Depth Cross Plot (DAKS Search criteria: oil, fluvial dominated deltas, other sands). 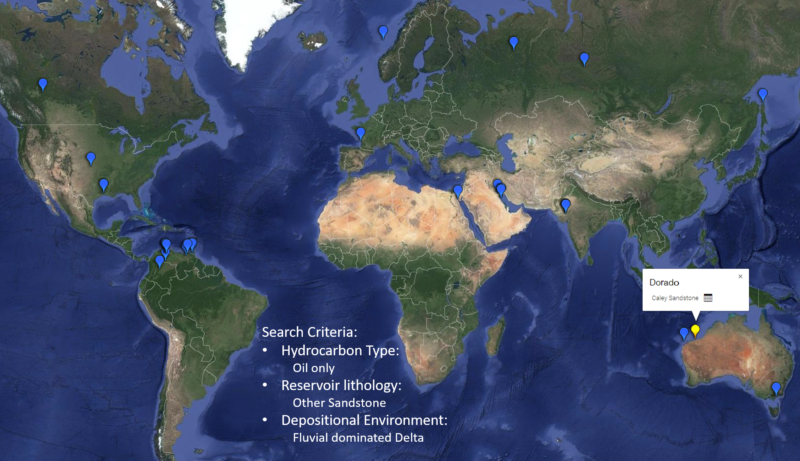 Figure 7 – Map of applicable global reservoir analogs.